So we all know the Galaxy Nexus and Android 4.0 Ice Cream Sandwich are now official, but there are probably a few things that the Google and Samsung event didn’t cover. I’m sure many of you watched the event live from YouTube.com/Android and if you didn’t the links above have all our coverage. We’ve spotted a few awesome features not covered during the event and all the details can be found after the break. Thanks to Dan Morrill over on Google+ we have an awesome list of some amazing new features for Android 4.0 Ice Cream Sandwich that were not mentioned by Google or Samsung during the event tonight. First we now can hide applications that we wont use — yes I mean all those pointless bloatware applications. In 4.0 ICS Android has introduced a feature called “disable apps”. We will have an option natively on any ICS device to completely disable and hide applications we don’t need or want. They wont be removed, but will be hidden, and will not use any resources. The application can be hidden or shown, once hidden will be gone from the application tray. So basically out of sight and out of mind, but still on the phone in case you ever need it. The download manager that was introduced with Android 2.3 Gingerbread has received an overhaul too, it features a new and simple user interface that is easier to understand. Downloads can quickly be viewed, cleared, or deleted right from the new download manager in ICS. Then he also mentioned a few things we did see from the Google event, such as all the settings menu’s being completely different and the revamped camera interface and controls. Google has put forth tons of effort in these areas and users will love the new changes and look. Dan then mentions all sorts of changes to the security and encryption. Honeycomb added full-device encryption, but ICS brings it to phones. There is also a slew of changes, enhancements and new audio effects that will all be available from the all new audio API. 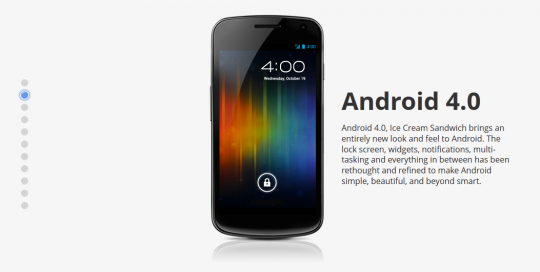 I’m sure we will hear plenty more regarding Android 4.0 Ice Cream Sandwich and all the new features over the next few days so don’t forget to check in often and see whats new at Android Community. Again all the latest news can be found on our Galaxy Nexus and Ice Cream Sandwich portals.